Estimating the taxes on a redeemed savings bond will help you save enough for your income tax bill. 1. How do I Calculate Interest on EE Savings Bonds? 2. How Long Will It Take My EE Savings Bonds to Mature? 3. Does the Rate on a Savings Bond Fluctuate With the Market? 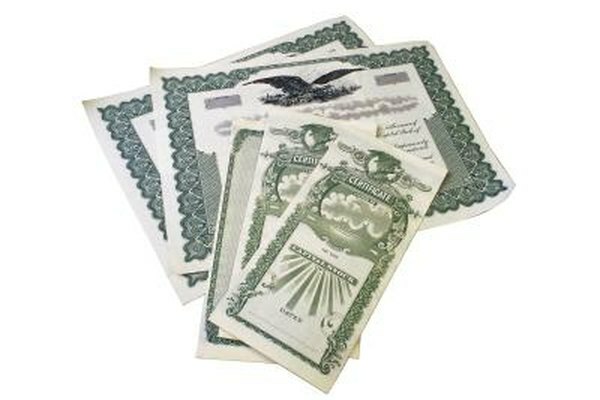 The U.S. Department of Treasury issued Series E savings bonds from May 1941 through June 1980. Originally created to fund World War II, the Series E bond was sold in denominations ranging from $25 to $10,000 and became fully mature after 40 years. The interest earned on a Series E savings bond is subject to only federal taxes, not state or local. Although the Internal Revenue Service and the U.S. Department of Treasury expect you to report the interest earned the year the bond matures, you can also claim the interest on your taxes the year of redemption. Download the Form 1040 Instructions from the IRS website. Open the Savings Bond Calculator, which is located on the Treasury Direct website. Enter the date that you sold the bond in the “Value As Of” field. Select “Series E” from the “Series” drop-down list. Select the bond’s denomination from the “Denomination” field. If you know the bond’s serial number, enter it in the appropriate field. Enter the issue date or the day you purchased the bond. Click “Calculate.” The amount of interest that the bond earned is under the “Interest” column. Write this number down. Refer to your previous year’s income tax return and find your filing status and taxable income. If your filing status or income has changed significantly since last year, you will have to complete a new Form 1040 using an estimate of this year’s information. Refer the Tax Rate Schedule in the 1040 instructions. Find the schedule that matches your filing status and then find the line that contains your taxable income. Slide over to the column that contains tax percentages. This is your tax rate. Write this number down. Multiply the interest earned on the bond by your federal tax rate. For example, if you earned $1,200 in interest on a Series E bond and your tax rate is 28 percent, your tax on the bond is $336, or $1,200 times .28. You should receive a 1099-INT from the U.S. Department of Treasury at the end of the tax year that you redeemed the bond. Box 3 on the form will describe the amount of interest you earned on the bond.